Thread: Guitar fever strikes again! 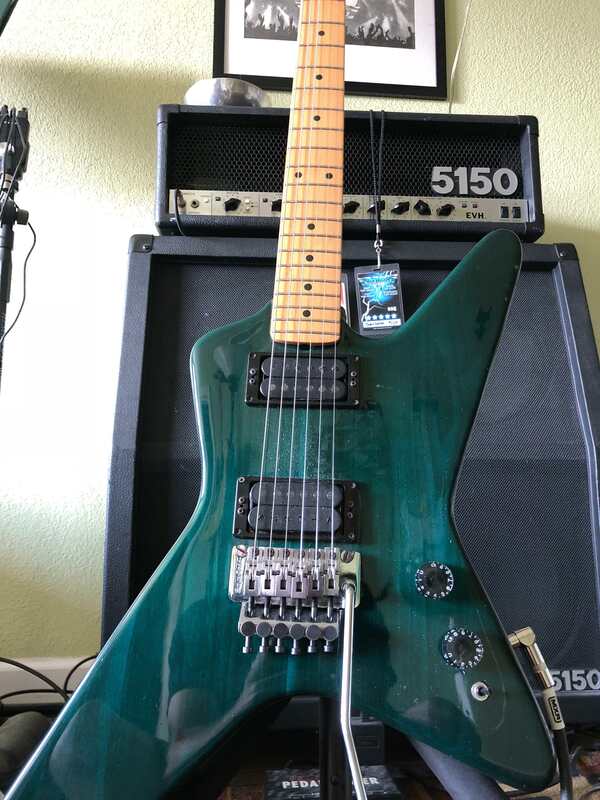 The pickups on those old Kramers were pretty good. I think they were made by Schecter. Also a bit of trivia on that bird's beak headstock. 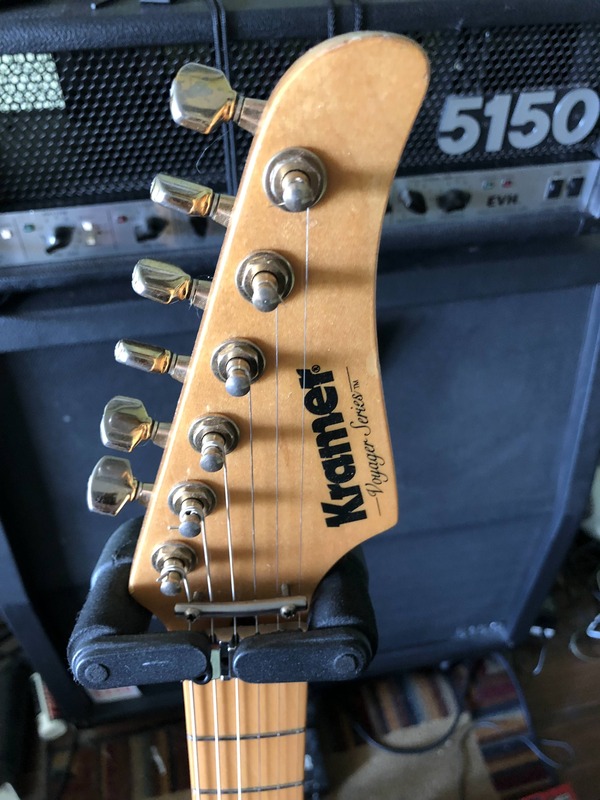 Kramer was selling guitars with Strat styled headstocks and Fender sued them. So they cut part of it off and wallah. The birds beak headstock as seen on the "Jump" video. I've played a few of the 'lawsuit' headstock guitars and the necks I've played have been very fat. Not in a bad way, but definitely not thin. I'll add one of those to the collection at some point. Haha! The good ol days. Ed is quite the drunken schmuck in this. This is always fun to watch.. good old Eddie.. The three bolt Strats had beefy necks. Also in those days necks were built by hand and could vary. Today on CNC equipment it's more consistent. Kramer was transitioning from the aluminum necks to wood necks at that time. I have no idea if the law suit necks had the same fretboard radius as a Fender. Really it was the time people were starting transform the Strat into being a better rock and roll guitar. Eddie wasn't the only one tweaking that design. Here you go. Humbuckers in a Strat in 1976. Before Eddie came onto the national scene. I was going to go to Guitar Center out by the airport, but the CIC is in town and I didn't want to get stuck waiting for the motorcade to go by. I'll go Monday and maybe bring another one home. The Kramer plays like butter!! I can't believe the condition it's in - just beautiful! The action is super low with no flat spots. A player all the way! I have a Kramer Elliot Easton. Probably my favorite guitar. Picked up a sweet late 82/early 83 Voyager. Took it to my guy and now it plays like a dream. For a 35 year old axe that fret board/neck looks like it's never been played!! That's exactly what my set-up guy said.. His theory is the previous set-up (stock?) was so bad that no one really played it. I tend to agree. It's official - I am a guitar-a-holic. This was delivered a couple of days ago. Used 2011 Wolf Special Hardtail Made in Japan. Not many of these available so somewhat rare. Particularly in quilted maple tobacco burst color. Where can I receive professional help. I looked at another one Friday. May go back and grab it this week. That looks great, I think tobacco sunburst is my fave look for a guitar. If you buy a used guitar like that at a good price then the way to look at it is that it's just keeping a bit of your bank balance in the form of a guitar which you can convert back whenever. but $750.00 including case and shipping seemed fair. There is a MIC tobacco burst special on Reverb that is mint new/refurbished. Seller says authorized refurbisher couldn't find anything wrong with it so they stamped "used" on back of headstock.